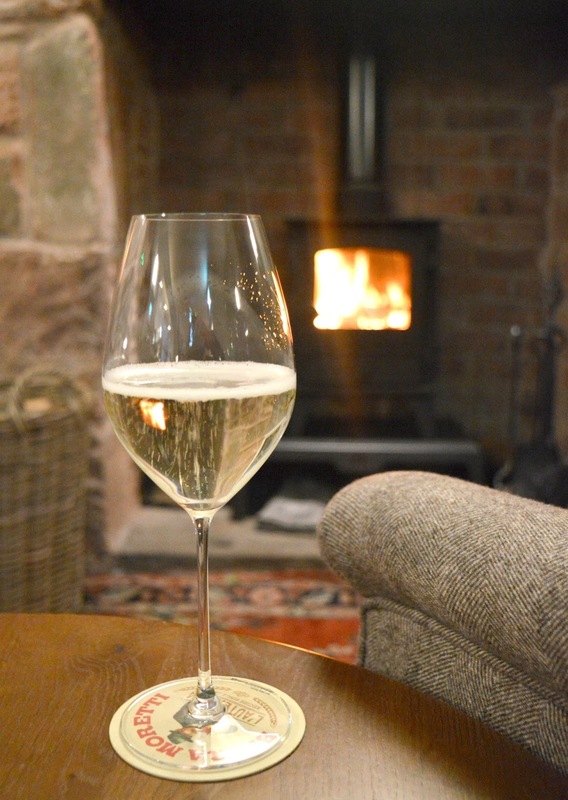 A Luxury Stay at The Pentonbridge Inn - Review of The Best Hotel in Cumbria! I've lived in the North East for over four years now but there are still some areas that I'm yet to explore. Hadrian's Wall to the west of the region, heading up to Cumbria and to the Scottish boarders is somewhat of a mystery to us, so when the Pentonbridge Inn invited us for a luxury stay in Cumbria we couldn't resist making the trip west and, I don't like to brag, but I think we've found the best hotel in Cumbria! The Pentonbridge Inn has only been open 6 weeks but was creating a bit of a buzz long before its first customers arrived. 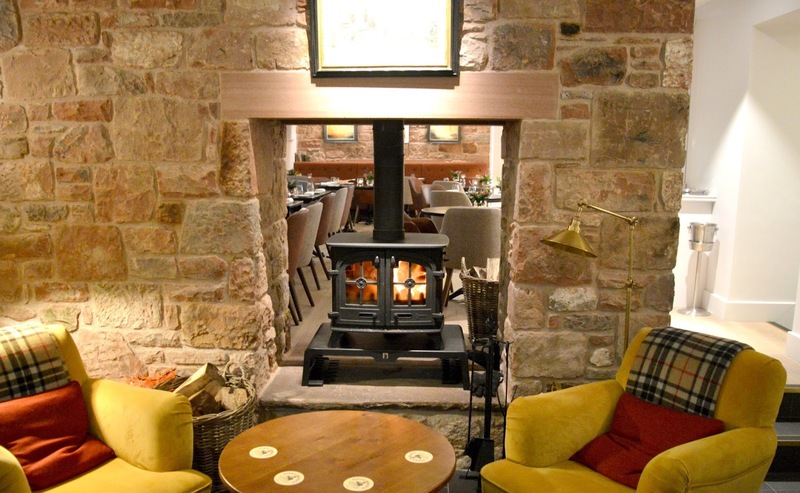 Opened by husband and wife team, Jack and Cassie White - ex chefs at the two Michelin-starred Marcus at the Berkeley in London, the Pentonbridge Inn promises somewhere very special for foodies in the north of England as well as nine luxury bedrooms and a cosy pub for locals and visitors. You'll find the Pentonbridge Inn tucked away in the tiny village of Penton. Sitting pretty in the Cumbrian countryside, it's a few miles north of Carlisle and so close to the border that a short stroll over the local bridge will take you from England into Scotland. 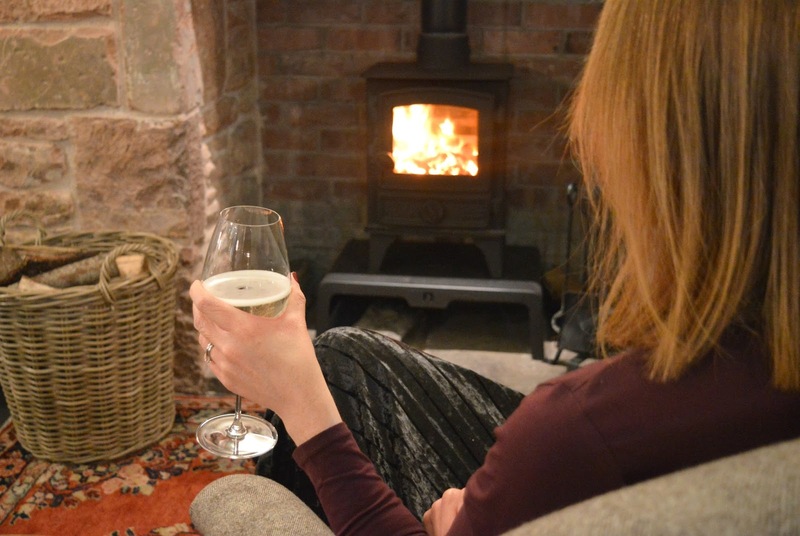 Ideally located for visitors to explore the Lake District and Hadrian's Wall country, the Pentonbridge Inn is a little slice of heaven reminding you how perfect life is in the north. We arrived at the Pentonbridge Inn on a very wintery Saturday afternoon with slightly cold feet after the first real icy spell of the season. We were so thankful when we walked through the front door and were greeted by a friendly smile and a toasty warm reception. Instantly feeling at home, we eagerly made our way up to our room for the night, the beautiful Grayme. 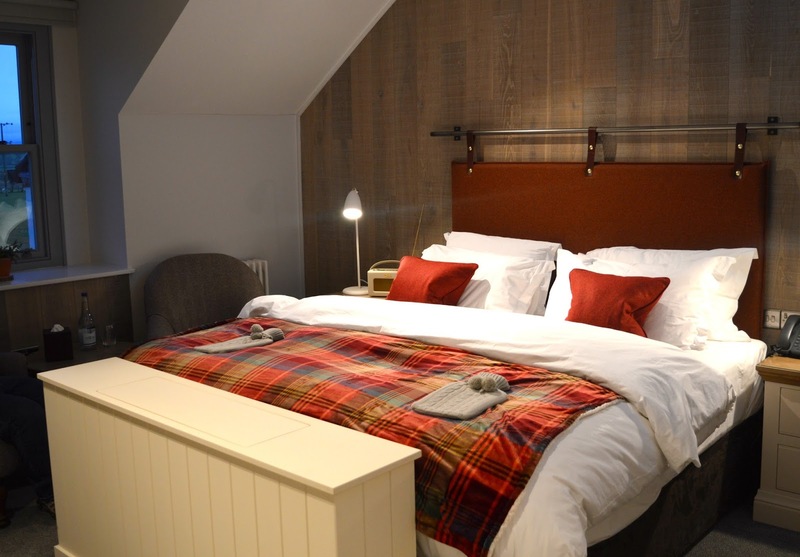 The bedrooms at the Pentonbridge Inn are beautifully decorated, each taking inspiration from the surrounding Cumbrian landscape and are the perfect combination of comfort and style. 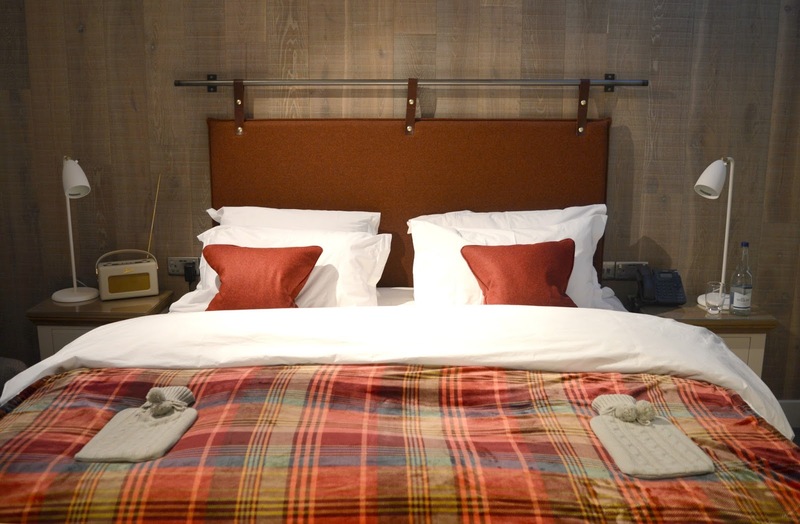 The Pentonbridge Inn is the kind of place you can go to truly switch off and escape. With limited phone signal (bliss) it's possible to switch yourself off from the bother of every day life although, if like me, you can't help but share your staycation on Instagram there's amazingly fast wifi through the Inn. In fact, the Pentonbridge Inn is not only super cosy it also has all of the gadgets you could possibly need to make your stay perfect. Simon loved the remote control that made a TV pop up at the foot of our bed and the computerised system that operated the window blinds - he's definitely going to want both for home now! Eager to enjoy our lovely room, we decided to have a bit of a relax before dinner and hibernate for an hour or so. 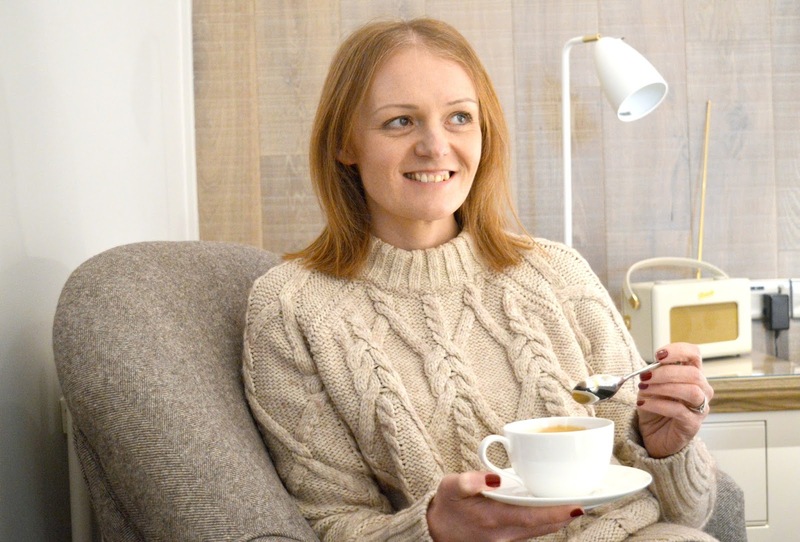 The Roberts Radio by the bed was set to Classic FM and we found ourselves enjoying listening to the soothing sounds of classical music as we settled down in the comfy chairs and made ourselves hot cups of coffee with our very own Nespresso machine. 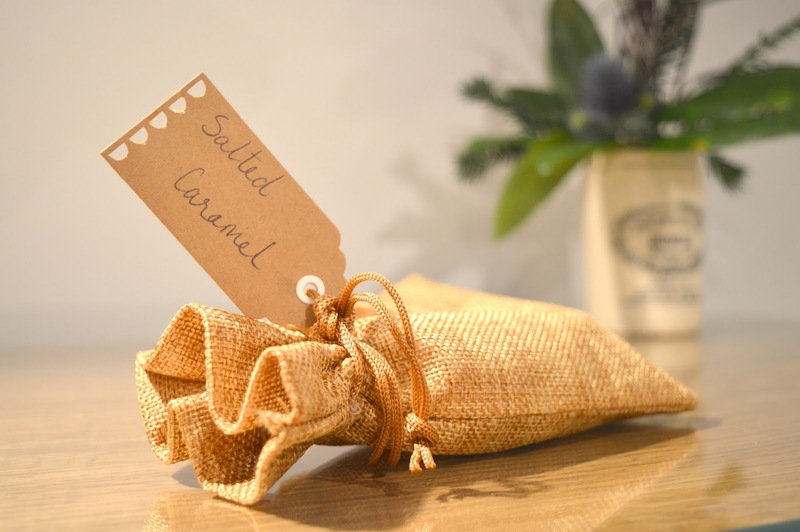 It wasn't long before we stumbled across a very interesting looking drawstring bag that had been left on the side for us along with a note welcoming us to the Inn, as soon as Simon saw it was labelled "salted caramel" he had his nose in there. He loves anything salted caramel and was over the moon to discover some very lovely looking chocolates. They were amazing! Delicious naughty chocolate with a runny caramel centre, just thinking about them makes my mouth water and I would honestly go to the Pentonbridge Inn again just for more of those treats! I would happily have spent hours and hours sitting in those comfy chairs, but the explorer in me was eager to get changed for dinner and head downstairs a little early for a bit of a nose. When your bedroom is beautiful there's a pretty strong chance that the pub and restaurant is going to be pretty special too! We made our way down to the pub and I was thrilled to discover two fires, loads of cosy corners and, amazingly, the place to ourselves. We must have timed it just right as by the time we'd settled into the best seats in the house (right by the cosy fire of course!) the bar had begun to fill up. As I sat sipping my fizz and enjoying the lovely warm fire on my face I amused myself with a spot of people watching. The pub was full of locals all greeting each other with big hugs and happy smiles and exchanging stories of their weekend adventures. They chatted happily between themselves and I couldn't help but smile, their high spirits were infectious and I commented to Simon that I wished our local was as lovely as the Pentonbridge Inn. As we neared the end of our drinks our waiter appeared with the food menu for us to take a look at ahead of our reservation. This is always my favourite way to enjoy dinner, I love being able to properly look at the menu without any time pressure and it's so nice to head to the table knowing that our orders are already with the kitchen. 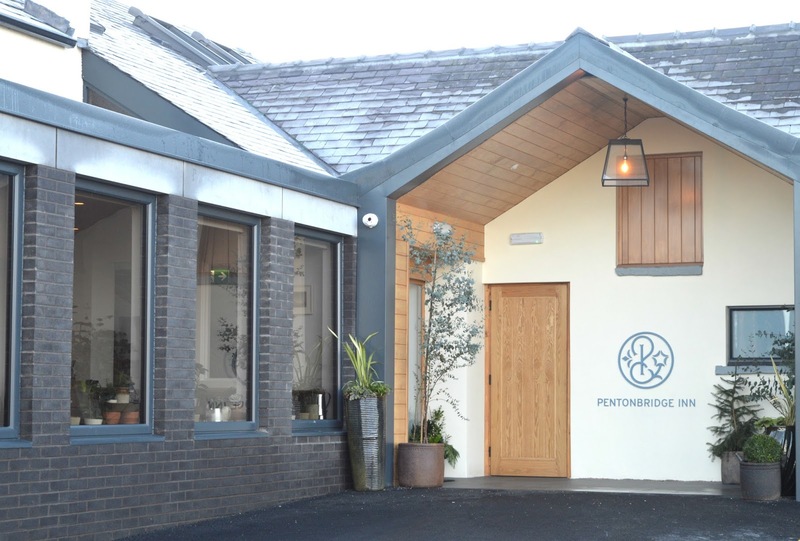 The Pentonbridge Inn offer an a la carte menu as well as a five course tasting menu with both changing daily offering the very best seasonal and local produce. With a lot of their ingredients coming from their Victorian walled garden at nearby Netherby Hall, the fruit and veg served at the Inn is fresh. We decided to go for three courses (£40.00) and with orders placed we were shown to our table with a prime spot overlooking the kitchen. I have to say I love having a good nose in a kitchen when I'm eating out, being an awful cook I'm always curious to watch the experts create their dishes and watching them put together something that looks amazing always leaves me stunned. 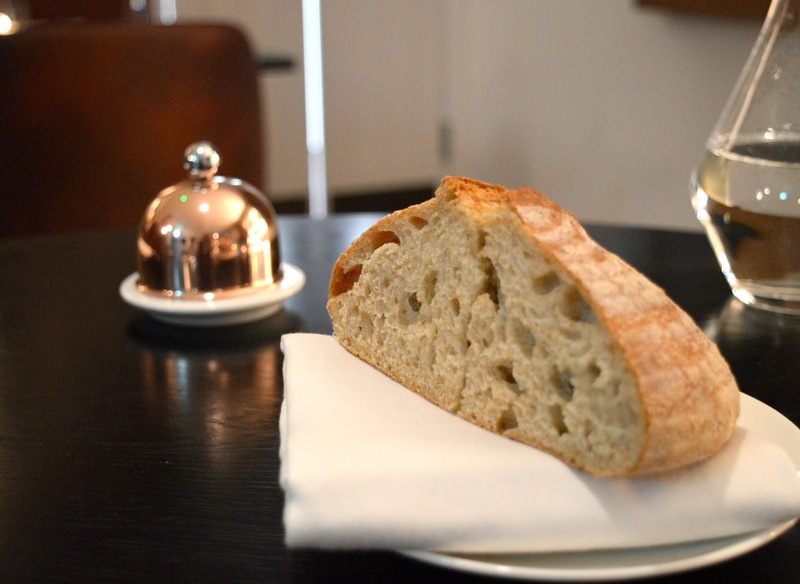 Our meal began with a huge chunk of freshly baked bread, still warm from the oven it arrived with salted butter inside a copper dish that I immediately became obsessed with. I never knew it was possible to fall in love with a butter dish, but just look at it! Nothing beats fresh warm bread smothered in butter and I was in heaven as I tucked in, we fell silent as we polished off the lot - if there's one thing I perhaps love more than chatting to my husband it's eating bread! Our evening meal at the Pentonbridge Inn was one of amazing discoveries and we were off on an amazing journey right from the start with our little taster, the Pentonbridge's twist on pease pudding; a northern obsession that I have never understood until now! I've tried pease pudding many times since relocating to the north but this is the only time I've actually enjoyed it. Served piping hot the crisp coating was delicious - this is the way to serve pease pudding! It's not often we go all out and enjoy three courses but we couldn't resist at the Pentonbridge Inn. 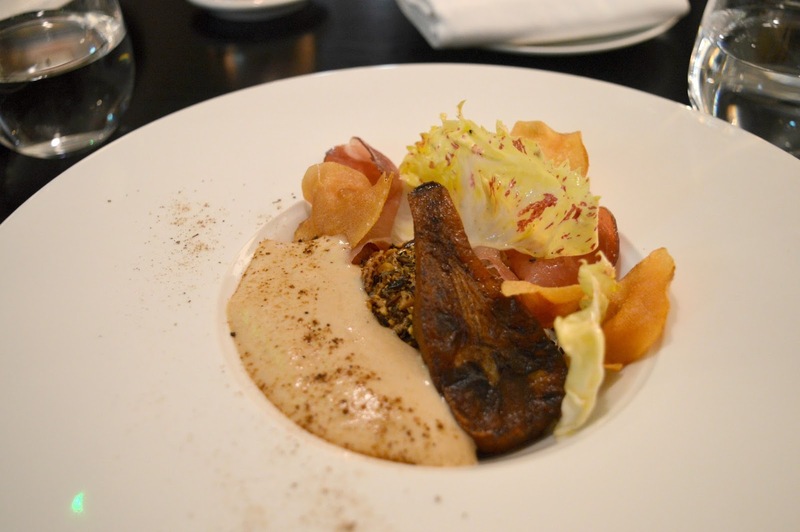 We both chose the same starter - Hen egg, Jerusalem artichoke, cured Tamworth pork and Puy lentils. I loved the different textures of the dish and the flavours were beautiful. Wiping my plate clean I started to feel a little sad that this lovely little place is quite a drive from our home. Newcastle to Cumbria isn't too far to go for dinner is it? With a small menu to choose from I picked something for my main course that I would never usually order. Lamb. I've never really got on with it and as a child I always whinged if Mum served up a roast lamb dinner. Served with violet artichoke, potato terrine, Ragstone cheese and olives, the lamb was served pink and I immediately realised where I'd been going wrong for all these years. 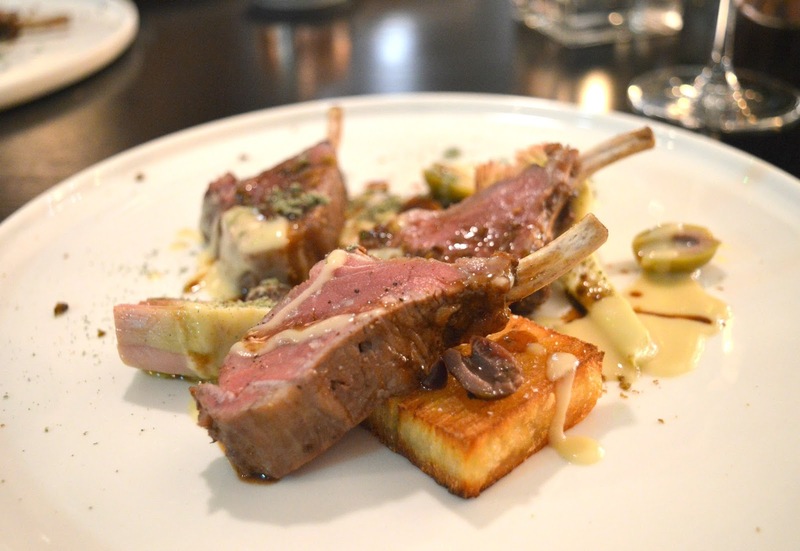 It was full of flavour, so tender and by the second mouthful I was declaring that I loved lamb! Second shock of the night, I despise olives, yet when I tried them with the Lamb dish they really brought an extra something to my meal and I eagerly ate the lot! I honestly couldn't get over how delicious the food was and how the Pentonbridge Inn had made me change my mind about foods I'd thought I didn't really like. 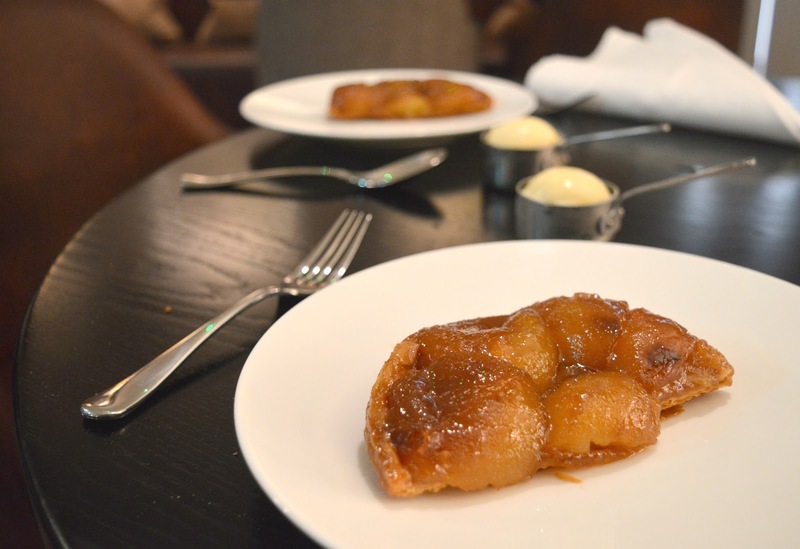 For dessert we both ordered the Apple Tart Tatin served with little pots of vanilla ice cream. It arrived whilst Simon was away from the table and I have to admit a little part of me was quite tempted to eat his as well as my own as it was so delicious. I'm a big fan of hot fruit dishes in the Winter time and this was the ultimate Winter warmer. Although it was tempting to crash out in the cosy pub for another round of drinks we decided to head back up to our room. All of that food had made us feel very sleepy and the temptation to snuggle up in bed with that amazing TV was too much to resist. As we settled down for the night it wasn't long before I was out for the count and I had a fantastic night's sleep in our huge bed and didn't wake until my alarm went off the following morning. 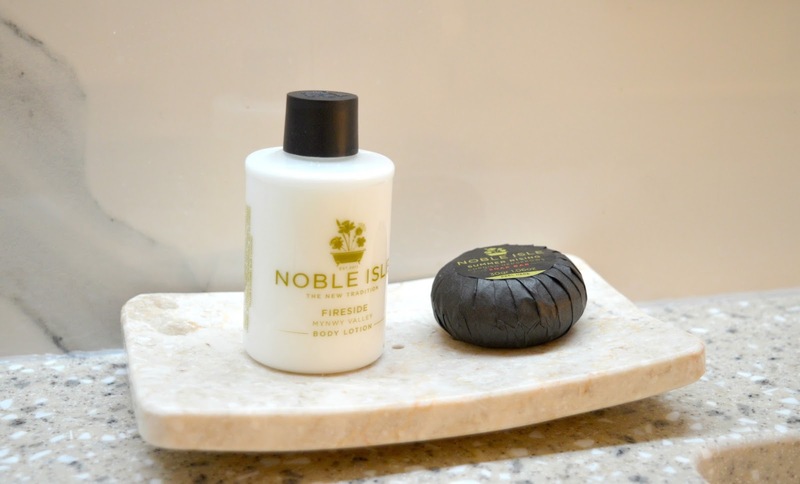 Showers were a joy in the morning, the bathroom was lovely and warm and I loved using all of the complimentary Noble Isle toiletries. Once I'd finished having a good pamper I wrapped myself up in a huge fluffy towel and then spent a little while wondering if I could just go down to breakfast in it, I was that comfortable! Clothes finally on, we made our way down to breakfast where we settled down at a table offering the most beautiful views of Scotland. Staying at the Pentonbridge Inn really made me realise how close we are to Scotland and how we really should make more effort to visit. Breakfast at the Pentonbridge Inn was incredible! 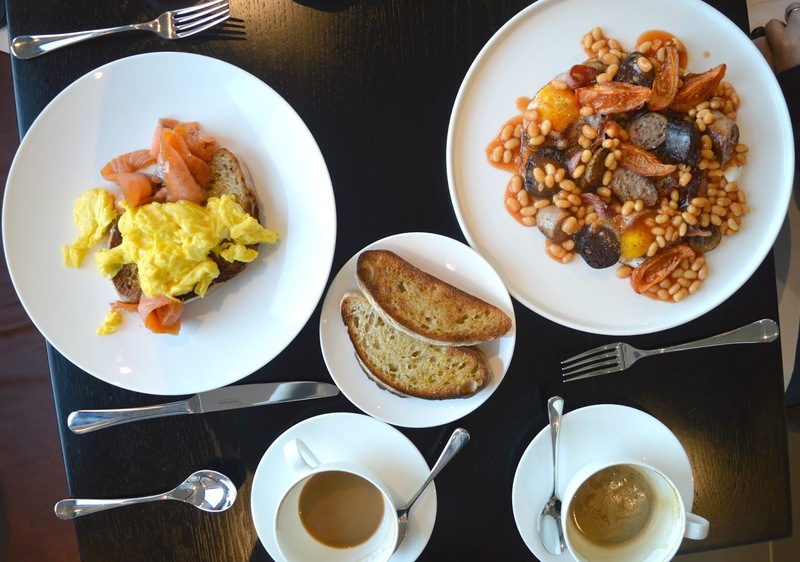 We have enjoyed a lot of breakfasts in our time, but the one we had that morning was on another level and I don't think we'll ever find one as good, they really did get it spot on. Perfect for the foodie, a never ending flurry of surprise dishes arrived at our table from the kitchen and we loved that each table got something different. 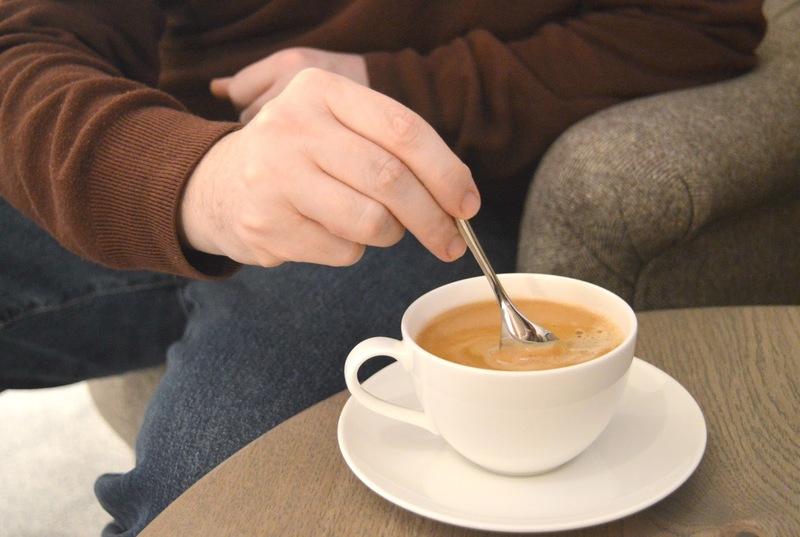 Just as we'd find ourselves looking enviably at something our neighbours had been given a moment later something even better would show up at our own table. Our feast began with homemade granola and fruit salad served with Greek Yoghurt and fresh juice. 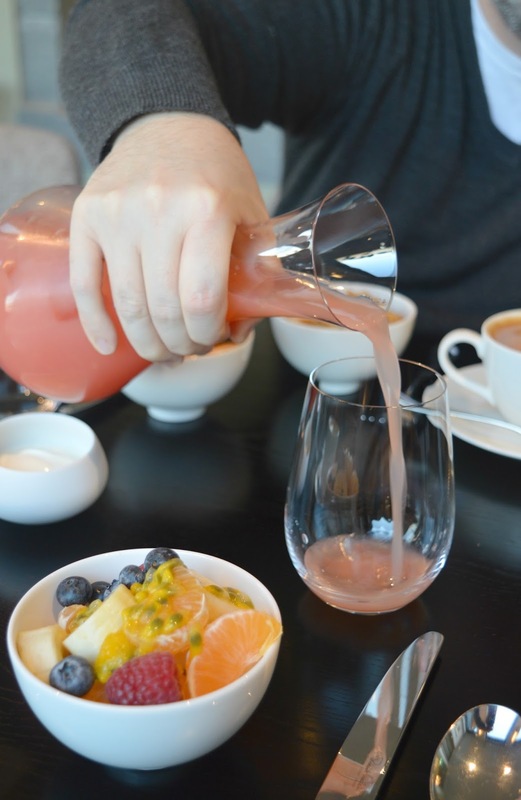 Each table had a different juice and ours was a deliciously zingy grapefruit juice. I've never found the thought of fruit at breakfast overly exciting but the Pentonbridge had managed to cram all sorts of goodies into the bowl including pears, raspberries, passionfruit and blueberries all topped off with some Greek Yoghurt it was the perfect start to our breakfast and left me thinking that I might recreate it at home. Settling down with our cups of coffee we had a little chat with a lovely couple on the table next to us. Celebrating their ruby wedding anniversary they had treated themselves to a weekend stay at the Pentonbridge Inn and were excitedly telling us about how the Pentonbridge had gone out of their way to make them feel special and that their tasting menu the night before had been the best food they'd ever had. I was so happy hearing their stories, I love when a hotel goes out of its way to make each guest feel welcome and special. 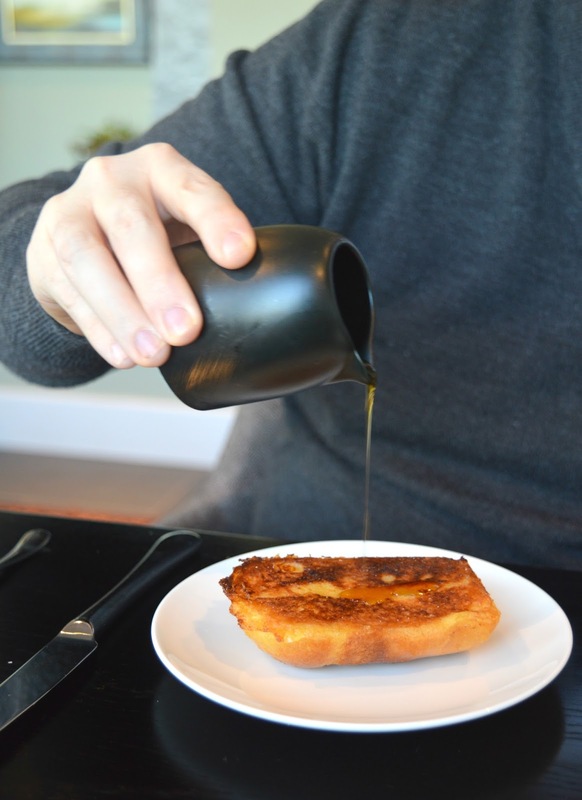 It wasn't long before our next course arrived at the table, French Toast hot from the kitchen with a jug of sticky syrup. 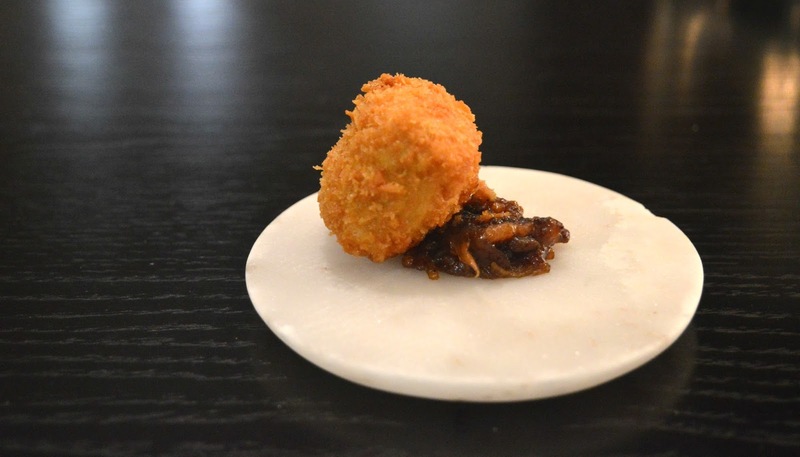 We knew what was coming for our third course as we'd chosen our cooked breakfast the night before. 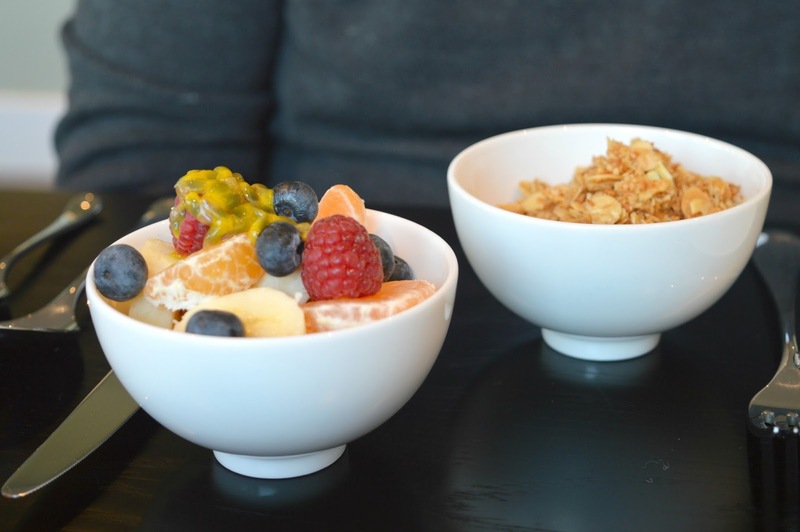 There's no breakfast menu at the Pentonbridge Inn so you can choose whatever you fancy! 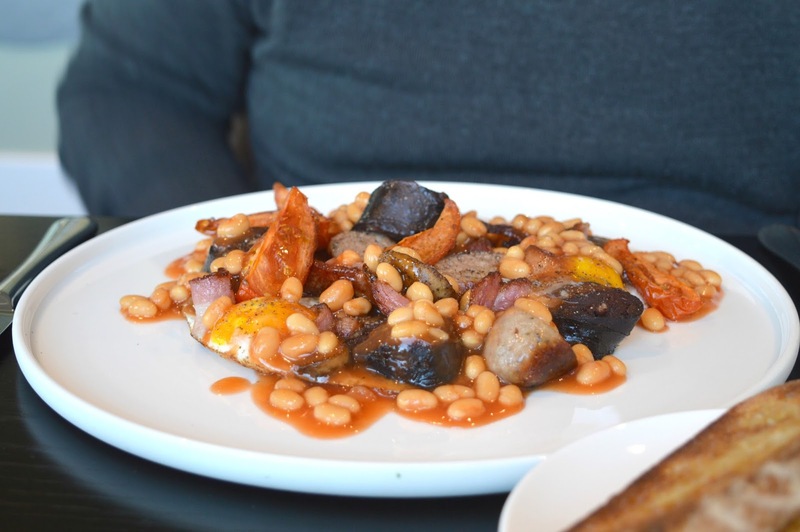 The kitchen have decided they don't want to restrict guests and so, as long as they have the ingredients, they will whip up whatever breakfast you fancy! 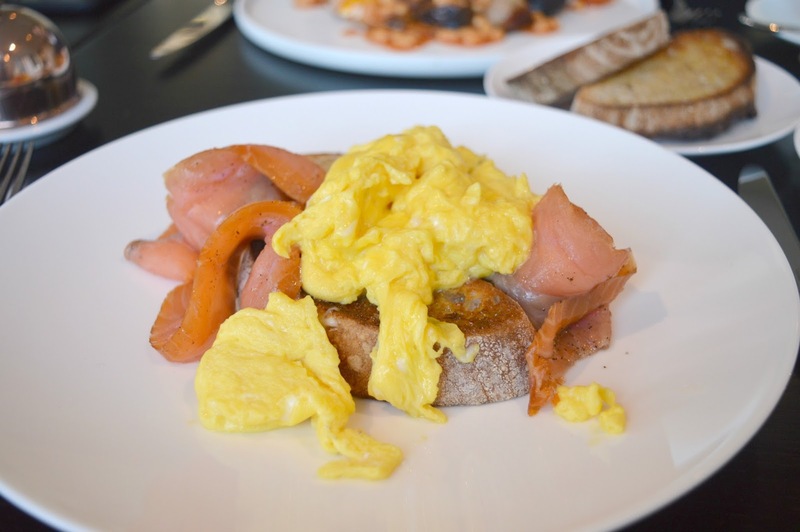 I decided to go for smoked salmon and scrambled eggs on toast and Simon went for a Full English. 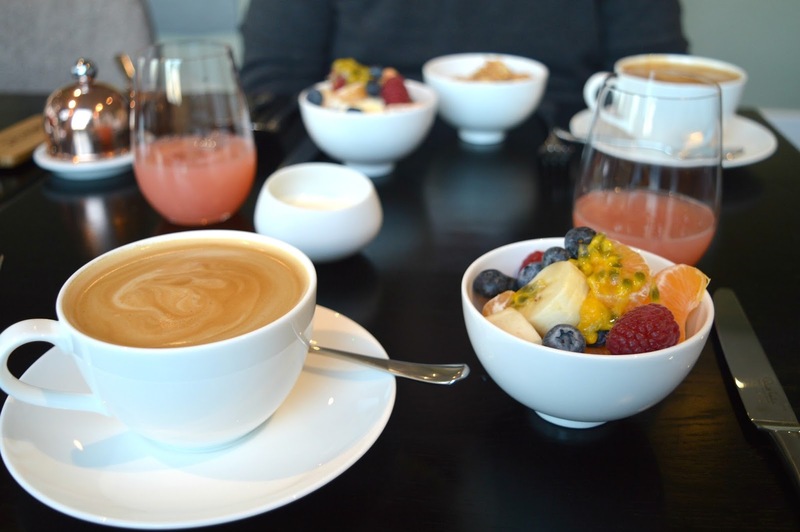 The portion sizes were so generous, in fact they were the biggest breakfasts we'd ever seen. Don't ask me how but I managed to polish mine off and sneak a few pieces of black pudding off Simon's plate, he's not a fan and as it was the best black pudding I'd ever had I wasn't going to let him waste it. You'd think after all that food it would be time to finish but there was one final treat to come from the kitchen. 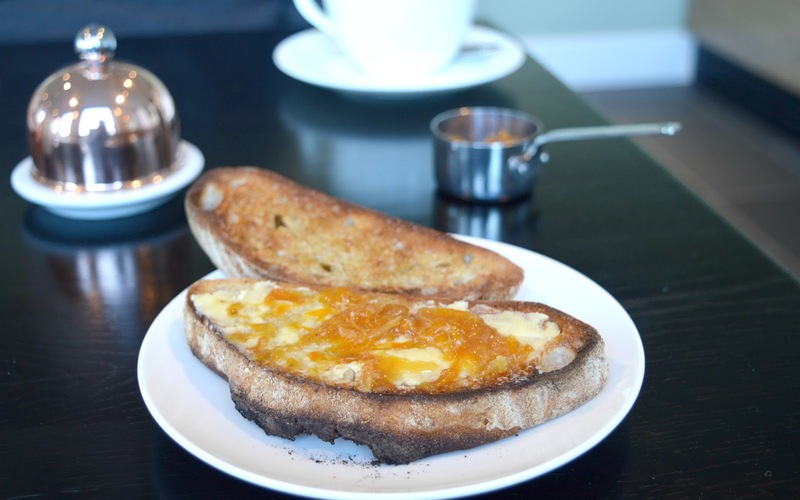 Toast served with salted butter and homemade marmalade that was still hot! Wow! I could honestly write an entire blog about how amazing the marmalade was, it was my first time trying proper homemade marmalade and I could suddenly understand why Paddington Bear is such a fan! Despite being ridiculously full I had to eat both slices of that toast just because I wanted to eat every last bit of that delicious marmalade. Our perfect staycation at the Pentonbridge Inn was over and we were both feeling so sad. We've stayed in a lot of really lovely hotels this year and both agreed that The Pentonbridge Inn was one of our favourites. There's no doubt that we will be back - our stay was so good and we really loved the food and our chats with the staff. As we checked out and gathered up our bags, the lovely receptionist gave us a parting gift - a very generous jar of marmalade with compliments of the kitchen. The Pentonbridge Inn like to give their guests a gift for the road and it seems my love for the marmalade had been noticed. Such a lovely touch! If you're looking for a picture perfect stay in the Cumbrian countryside I highly recommend you book a weekend at the Pentonbridge Inn! We were guests of the Pentonbridge Inn and received a complimentary night's stay with dinner, drinks and breakfast in exchange for this honest review. It was out of this world! I'd travel all that way just for the breakfast! We’ve been looking for inspiration for a short break for next year. Me and Cat are planning a child free weekend. This place looks so cosy. 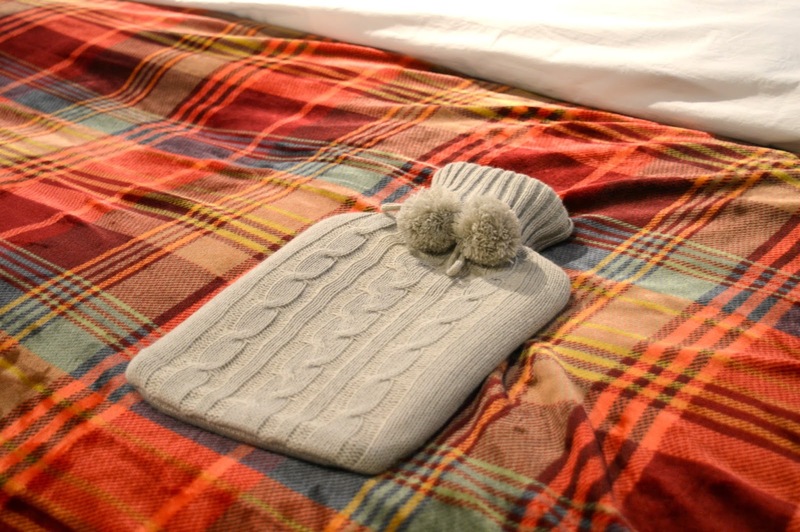 Loved the hot water bottles. Would this be cosy in the summer too or does the set up lend itself to the colder seasons?